Göttingen (German pronunciation: [ˈɡœtɪŋən] ( listen)) is a district (German: Landkreis) in Lower Saxony, Germany. 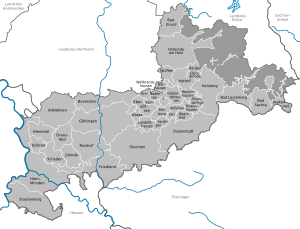 It is bounded by (from the northwest and clockwise) the districts of Northeim and Goslar, and by the states of Thuringia (district of Eichsfeld) and Hesse (districts of Werra-Meißner and Kassel). In 1885 the Prussian government established the districts of Göttingen, Münden and Duderstadt within the Province of Hanover. These districts existed for 88 years, before they were merged in 1973 to form the present district of Göttingen. On 1 November 2016, it was reformed by the addition of the former district of Osterode. The western half of the district is occupied by the Weserbergland mountains. The Weser River receives its name near the town of Hannoversch Münden, where the Fulda joins the Werra. Further east the Leine river runs through the district from south to north. In the upper part is the heraldic lion of the Duchy of Brunswick-Lüneburg. Below is a combination of the arms of the former districts, which were merged in 1973 to form the present district: the shield of Münden, the anchor of Göttingen, and the wheel of Duderstadt. ^ "Gebietsänderungsvertrag zwischen den Landkreisen Göttingen und Osterode am Harz" [Treaty between the districts of Göttingen and Osterode am Harz] (PDF) (in German). District of Osterode. 1 February 2014. This page was last edited on 11 April 2019, at 16:05 (UTC).